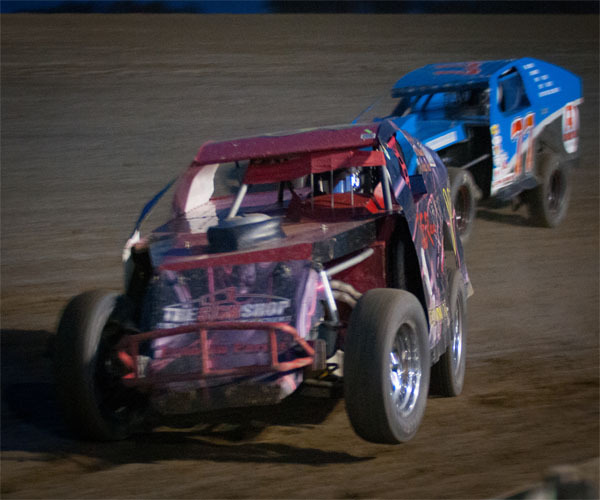 (Photos courtesy of LPT Images) It was a hot night for racing at the Dacotah Speedway on July 19th. Despite the heat, fans packed the stands for an exciting night of racing. 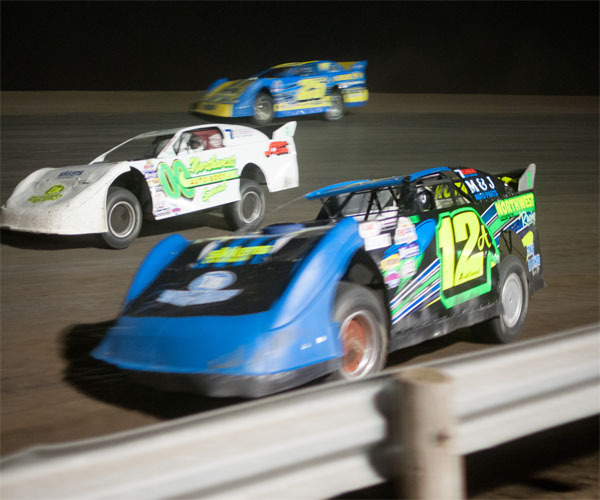 An IMCA Modified concy kicked off the night after a brief intermission. The top eight drivers would transfer to the 24 car feature. Bismarck's Brian Swenson started on the pole and pulled away quickly on the start. Behind Swenson, second place Dave Aberle tried to hold off Gladstone's Kirk Wojahn, Brad Hanson and Brent Schlafmann. Schlafmann passed Hanson and challenged Wojahn for third place. With six laps to go, Schlafmann passed Wojahn but the two drivers made contact, sending Schlafmann's car spinning and into the pits to change a tire while Wojahn was sent to the tail of the field. On the restart, Swenson pulled away again and Hanson slipped by Aberle for second. But Swenson's car was much too fast for Hanson to chase down. Swenson led all 12 laps to win the concy. Hanson finished a distant second ahead of Aberle, Travis Ulmer, Kurt Erdman, Brad Steffes, Wyatt Dinius and Herb Bargmann who all transferred to the feature. 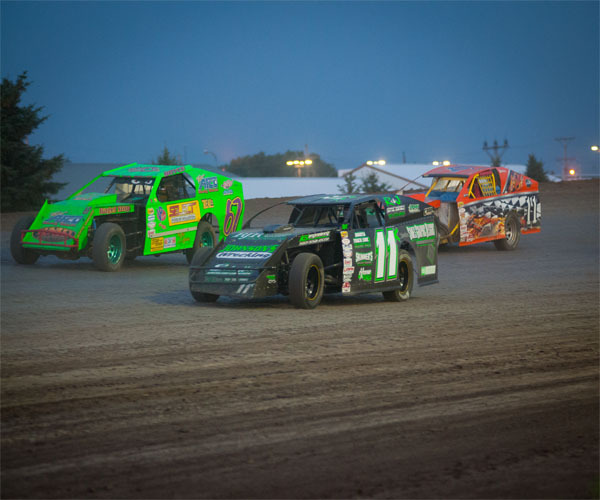 While drivers flew through their heat races earlier in the night with hardly any cautions, that was not the case in the features. 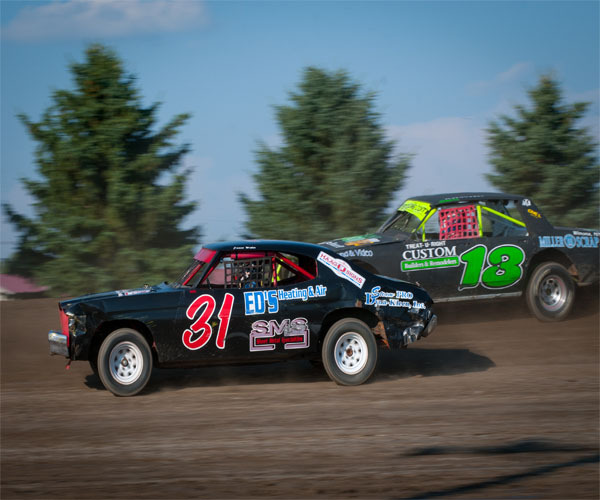 On a complete restart, Dana Welder and Aaron Aaseth raced side by side for the lead in the Hobby Stock feature. 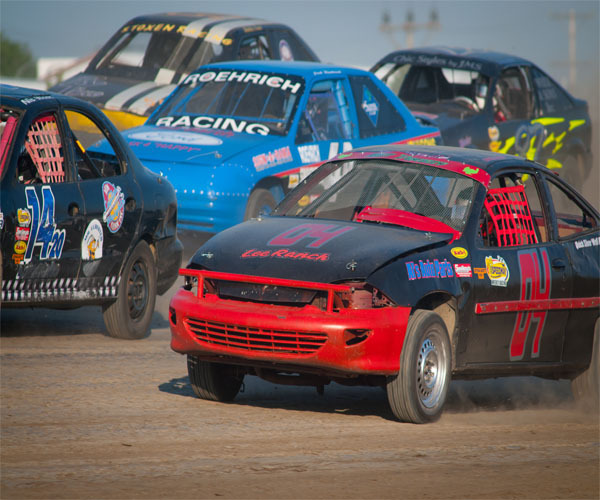 Aaseth's yellow camero took the lead with Welder and third place Jaren Wald in close pursuit. Scott Gartner, who was caught up in a lap one caution, quickly drove through the field and with three laps to go, Gartner was all over fifth place, Jeremy Englehardt's bumper. But Gartner ran out of time, as Englehardt held him off to finish fifth. Points leader Chad Hausauer finished fourth, stretching his points lead over second place Gartner. Jaren Wald finished a career best of third place behind Wishek's Dana Welder and first time feature winner Aaron Aaseth. Bismarck natives John Feist and Shawn Volk started on the front row of the WISSOTA Street Stock feature. They raced side by side for the lead before Volk powered by and started pulling away until back to back cautions slowed the race. 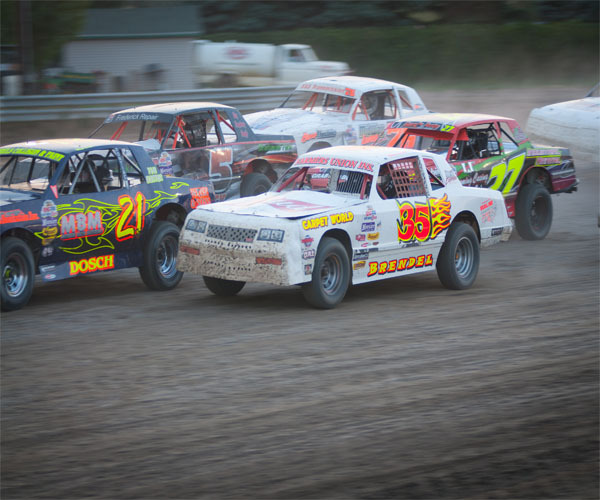 Yet Volk continued to lead and on the restart second place Feist had his hands full behind him with Matt Brendel, Allen Frederick and Matt Dosch. The fourth caution came with eight laps to go and on the restart Dosch's high line landed him in se cond place and all over Volk's bumper. The following lap, the fifth caution regrouped the field once more. On the restart, Dosch went three wide for second with Feist and Brendel and got shuffled back as Feist retook second place. The final caution of the feature came with two laps to go. Volk thew his car deep on the restart, hugging the guardrail as Brendel's high line passed Feist and challenged Volk for the victory. Volk led all 20 laps to hang on and win his first feature victory of the season. Feist made a last lap pass on Brendel to finish second. Eric Paul finished fourth and Matt Dosch rounded out the top five. 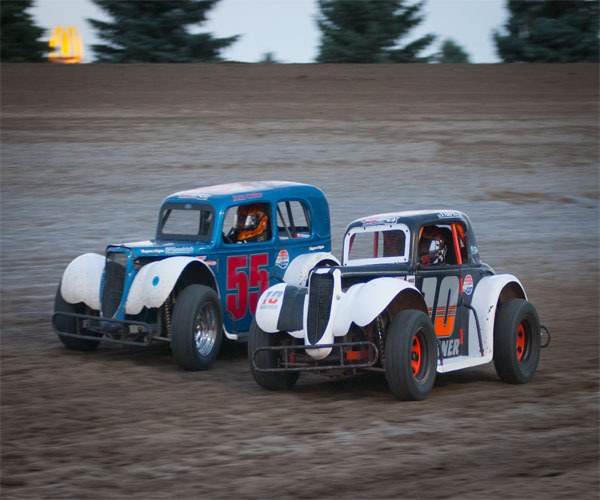 After a complete restart in the INEX Legend feature, Tom Wagner and Ivan Sailer were side by side for the lead. The veteran Sailer took the lead as Wagner tried to hold off the young gun Troy Hoff. Wagner rallied back and challenged Sailer for the lead, bringing Hoff with him. The three drivers battled for the lead until Wagner took the top spot on lap four. A lap six caution regrouped the field but on the restart, Wagner pulled away as Sailer, Hoff and Paul Huettl raced hard for second. Hoff shuffled into second as Huettl passed Sailer for third. Coming out of turn four, Hoff's car bobbled, allowing Huettl and Sailer to pass him. Hoff fell into the clutches of fifth place Shane Williams. With four laps to go, Williams took the fourth position from Hoff. As Huettl and Sailer continued to race side by side for second, they were quickly catching leader Wagner. With only three laps to go, Wagner's car got loose out of turn four and Huettl drove into the lead. Wagner tried rally back but Huettl crossed the Open Road Honda finish line first. 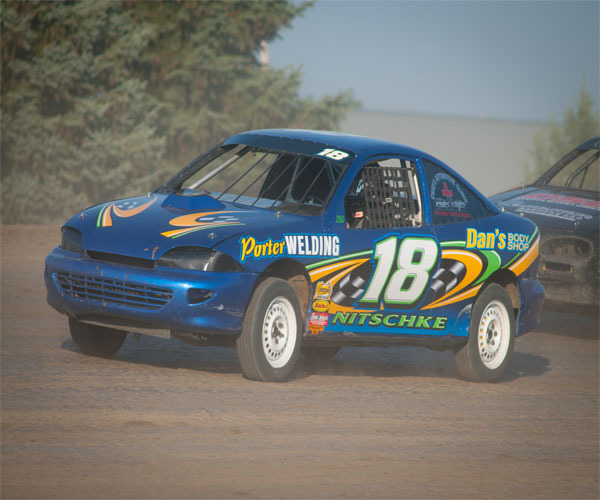 It was Huettl's first win since 2010 at the Dacotah Speedway. Wagner finished second ahead of Sailer, Williams and Hoff. Minot's Spencer Wilson held onto his lead after a series of quick cautions in the IMCA Modified feature. Points contender Shawn Strand, who was charged with the first two cautions of the feature was sent into the pits on lap two. While points leader Jeremy Keller quickly raced his way into the second position after starting eleventh. Keller and third place Mark Dahl chased down leader Wilson and it was a three car battle for the lead on lap nine. Keller's high line was the fast line and it gave him the lead with 13 laps to go. A caut ion with 11 laps to go allowed Keller to pull away as Dahl, Wilson and Aaron Turnbull battled for second. Turnbull shuffled into second position as Wilson quickly faded, losing spots to Dahl, Marlyn Seidler and Jared Thelen. On the final caution of the feature with eight laps to go, Dahl missed the restart and dropped from third to sixth. Thelen quickly passed Seidler on the restart and closed in on second place Turnbull. Thelen ran out of laps as Turnbull held him off for second place. Seidler finished fourth ahead of fifth place Tracy Domagala. Feature winner, Jeremy Keller, led the final 14 laps to win his fourth feature of the season. Rookie Nic West took the lead away from pole sitter Alex Thompson in the IMCA Sport Compact feature. West pulled away quickly but had a flat tire on lap two, sending him to the pits and handing the lead to p oints leader Derek Nitschke. 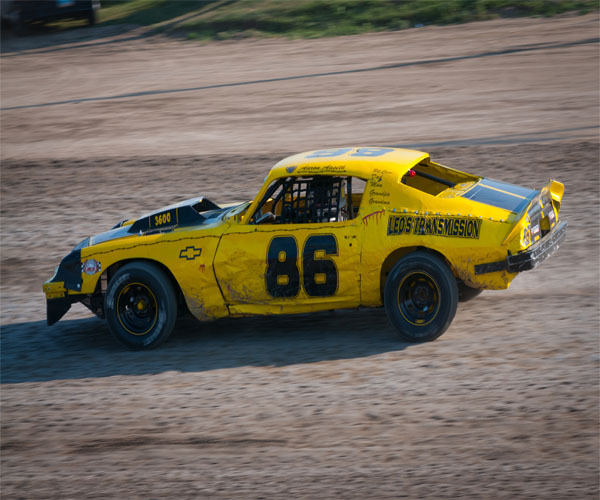 Last week's feature winner Josh Roehrich passed Thompson for second and set his sights on leader Nitschke. Roehrich slowly started to close in on Nitschke but ran out of time. 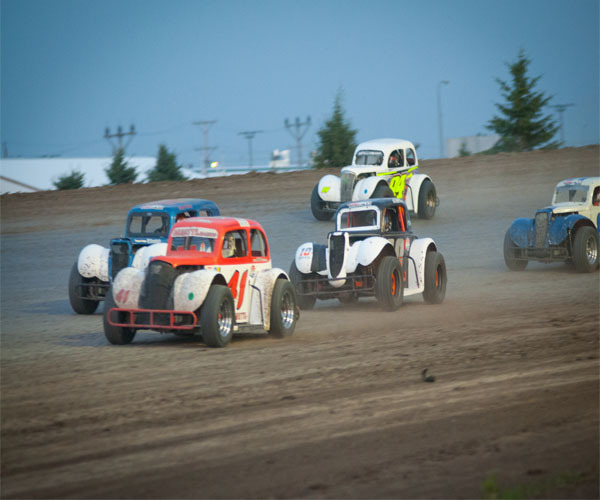 Nitschke held on to win his fourth feature victory of the season. Roehrich finished a close second ahead of Thompson, Cody Schulz and Kayla Koth.